The plethora of food allergies I suffered from as a child included ones to wheat, sugar, and milk. The cow's milk allergy prompted my parents to feed me goat's milk, soy milk, and occasionally something more obscure like rice milk or almond milk. So I'm no stranger to "alternative" milks. And in recent years, soy milk and almond milk have become more and more popular—almost mainstream. 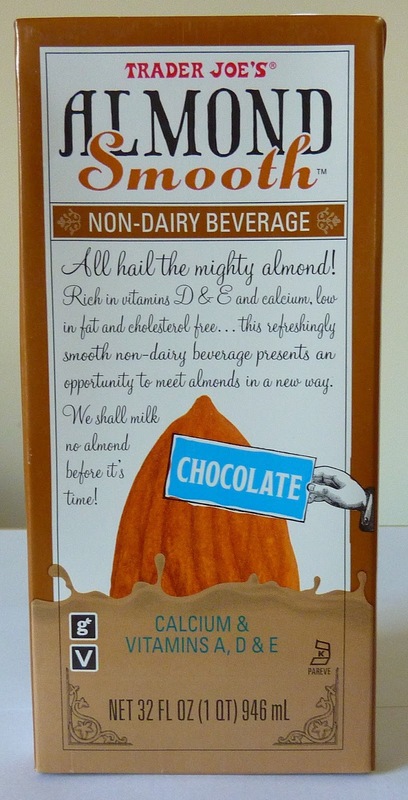 The most ubiquitous brand of almond-based beverages is of course Almond Breeze, put out by parent company Blue Diamond. And both Sonia and I agree that TJ's Almond Smooth blows Almond Breeze away. That was sort of a pun. Get it? "Blows the breeze away." Because breezes usually do the blowing away... oh never mind. This is the first flavor of Almond Smooth that we've tried, so we can't really vouch for the others just yet, but we've heard nothing but good things. They also offer a sweetened vanilla flavor and an unsweetened vanilla. The sugariness of the chocolate is perfect. It's not overbearing, but they didn't underdo it either. Likewise, the chocolate flavor blends with and enhances the almond base. 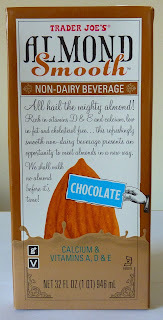 It doesn't compete with it, as I've often felt was the case with beverages like Silk Chocolate Soymilk. But then, you never hear about chocolate-covered tofu or anything like that. But there are a few classics that come to mind when you think about chocolate paired up with almonds. In the past, we've taken looks at other non-dairy milks from Trader Joe's. Just check out our reviews of TJ's Light Coconut Milk and their Vanilla Coconut Milk. So far, this one takes the cake. It's super smooth and highly-drinkable. Click here to see a nice cold glass of it, straight out of the box. We also got a little crazy and made smoothies with it. We dumped it into the blender with ice cubes, bananas, and peanut butter. And yee-haw, that was friggin' delicious. It was smooth and rich, akin to the legendary Peanut Butter Moo'd smoothie from Jamba Juice. Sonia went crazy immediately. She was extremely pleased with this product from her first sip. 5 stars from her. I enjoyed it right away, but wasn't completely blown away like she was. After our smoothies, however, I started thinking about the potential and versatility of such a beverage. Furthermore, it's one of, if not the best non-dairy milk I've ever had. So I'd feel like this product were getting robbed of its due if I gave it anything less that 4.5 stars. So it looks like we're going to record this happy box of almond love in the hallowed halls of our Pantheon. I'll have to try this in smoothies! Mmm. Their coffee creamer is good, too, in my opinion (for being cholesterol free, gluten free, and lactose free). Never tried the creamer, Jerrica, but maybe we'll check it out now. Thanks for the rec! I LOVE THE CREAMER... As far as soy milk, I will only drink their unsweetened plain soy... something about flavored soymilk, is a turnoff to me..
Actually I do not prefer their Chocolate Almond Milk (or their Chocolate Soy back when I used that) over the commercial brands because I use it exclusively in my coffee and it's sweetness level is not as high! It is nice to have a shelf-stable carton or two on hand when I run out of my refrigerated containers though. I have never had almond milk, but have wanted to try it for some time now. When I read this post, I was SO excited for my next trip to TJ's! I had it all planned out...I was going to find it, try it, and (if it was as amazing as you said) buy it! Imagine my sadness when I discover that my local TJ's doesn't have this, but Chocolate Almond Breeze instead (and I looked high and low for this). But, I picked myself up, wiped my eyes, and decided to at least try the Almond Breeze. It was AMAZING! I really liked it! I even (somehow) managed to get my dad (who normally wouldn't touch something like "Almond Milk" with a ten foot pole; the man doesn't like chicken, for fear he will get salmonella poisoning) to try it. Surprisingly, he liked it too! Unfortunately, we were unable to get some that day (we live about an hour and twenty minutes from our TJ's, and already had a cart FULL of groceries), but my mom picked up some today, and I'm excited to have it COLD this time.